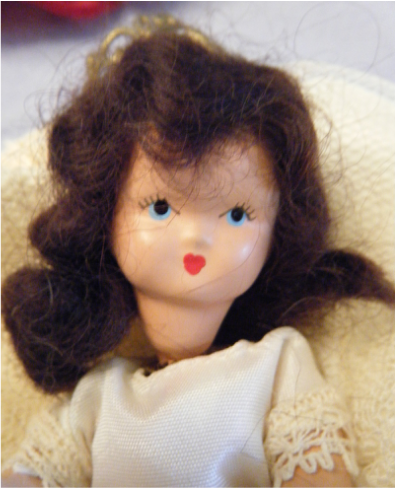 This doll was acquired at the same yard sale as the Unmarked Oilcloth, Colonial Dame and Unmarked Wood & Bisque. 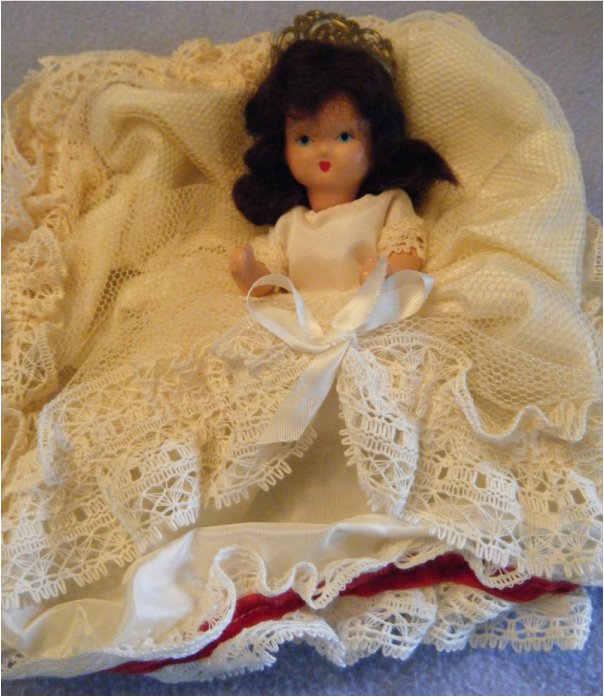 It is a composition doll that needed to be restrung. The elastic band for the head and legs was missing and the elastic band for the arms was present but deteriorated and broken. 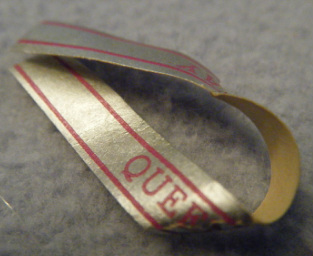 The arms were held in place because the broken band had hardened into shape with age. 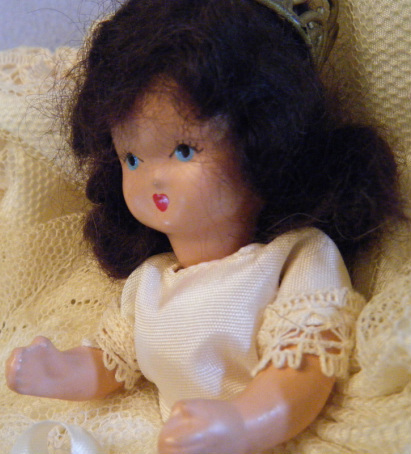 The doll itself is very simplistic and generic - so that it could portray dozens of figures. This doll is all about displaying elaborate clothing. 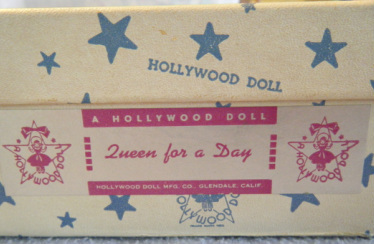 In this case, the doll is wearing the costuming associated with the radio and television game show "Queen for a Day" that aired from 1945-1964 (Wikipedia). The dress is massive and made frommultiple layers of satin-ish material, lace, and ribbons. The doll's head was loose - we set it in place for the photo (before restringing). The photo doesn't show it, but the brass hook attached to the bottom of the head looked to be a flanged cup hook. My guess is that it is original to the doll and not a replacement. 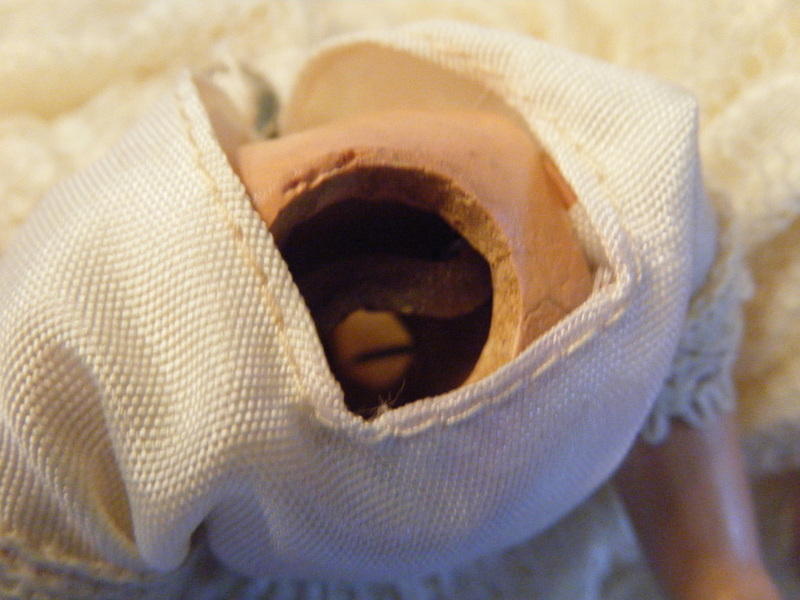 We had to undress the doll to see the state of the composition body before attempting a restringing. A cracked body could shatter from the tension necessary to attach new elastic bands. The body looks fine. This is an interior view of the body looking into the neck opening. 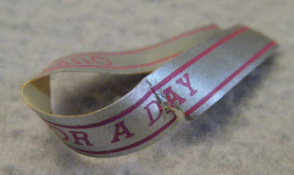 The original elastic band joining the arms is barely visible (just above center of the opening). We didn't know the original stringing configuration for the neck and legs so we opted for two elastic bands. We attached both bands at the neck hook and ran one to each of the leg hooks. 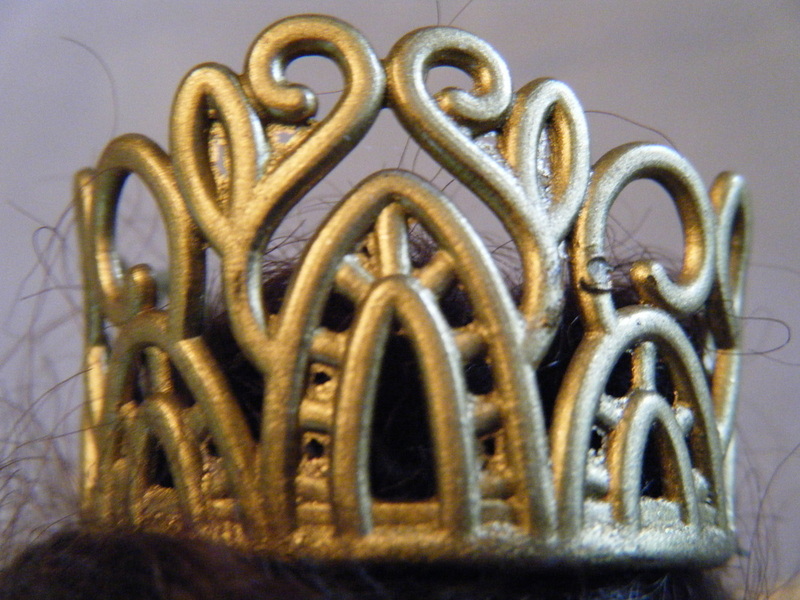 Close up of the crown. It looks pretty good at first glance but closer inspection reveals lots of flashing from the molding process. It probably would not have been cost effective to pay workers to remove the flashing. 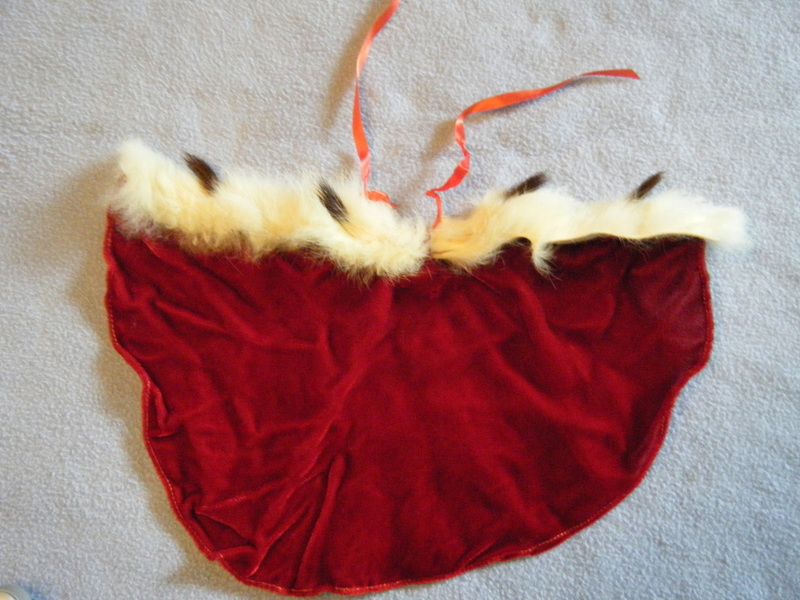 What queen doll is complete without a full length plush red robe edged with ermine fur? 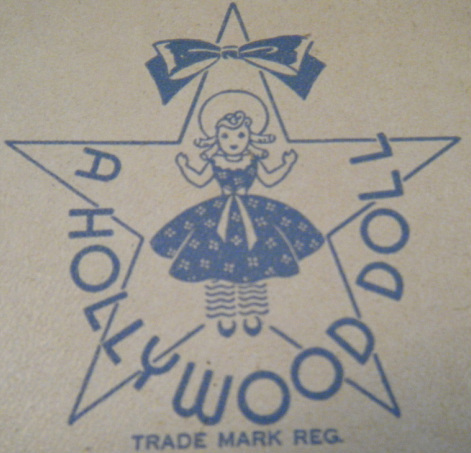 The wording at the bottom of the label says "Hollywood Doll Mfg. Co. Glendale, Calif"
This is a small composition doll so the fingers are not individually modeled. The composition body was in good condition but the top of the left leg exhibits some large cracks. Here is what the legs looked like prior to restringing. Notice that the "hooks" appear to be hand bent nails molded into the compo. 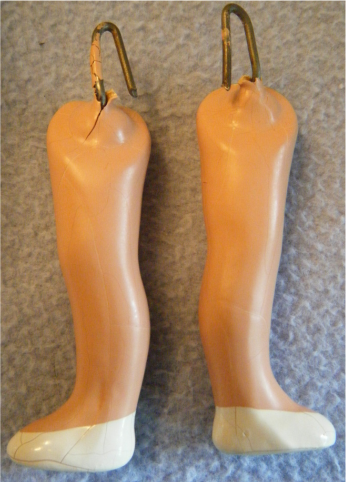 One leg is cracked at the hook and both legs exhibit crazing on the shoes. We aren't entirely sure how the loose and torn "Queen for a Day" banner was attached to the doll originally. It was either a hang tag for the arm (likely) or a sash. 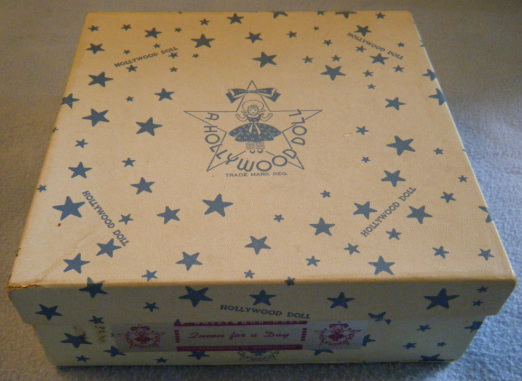 The doll came with its own well made, lidded box. The designers obviously intended the box to be a way to store the doll - not just a discard upon opening package common in the 1960's and beyond. I'm not sure of the story behind the logo. It appears to be "Bo Peep" inset inside a 5-pointed star with a bow at the top.